Description In mid-June 1943, Snelling Robinson, a 20-year-old Harvard graduate and newly commissioned ensign in the U.S. Naval Reserve, joined the pre-commissioning crew of the Fletcher class destroyer USS Cotten. The new crew trained for the remainder of the summer and t hen sailed to Pearl Harbor in time to join the newly established Fifth Fleet. Under the command of Admiral Raymond Spruance, the Fifth Fleet was given orders to invade Tarawa in the Gilbert Islands in November 1943. 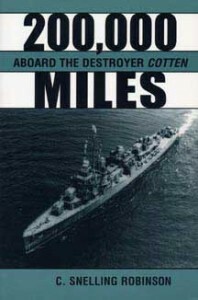 This offensive, along with naval battles in the Philippine Sea, the Leyte Gulf, and the invasion of Iwo Jima in February 1945, is chronicled from the perspective of a young deck officer and is integrated with the background of the larger conflict, including the politics of command. After Japan’s surrender, the Cotten became a part of the Occupation Force anchored in Tokyo Bay. Robinson deftly narrates how he and his friends took advantage of their good luck and brought their roles in the war to a fitting conclusion.